Life, light and Love are not only transformational, but are also transcendental, coming from and going beyond the seeming limitations of time, space, earth, body and mind. Because the Energy of Love is both Spiritual and Quantum, it is also Transcendental, and thus able to perform Miracles! The old way to heal with energy was to "protect yourself and then change what is wrong" with your client. The newer way was to know your connection with All-That-Is (thus, no need for protection) and then help the client "relax, release and rejuvenate". The newest way NOW is to "Know that All is Connected and then consciously connect with the love that exists throughout the dimensions and intend for it to transform what ever is not in harmony, into a higher vibrational state". In the worlds of spirit, nothing can be held at arms length. All my healing techniques are complimentary to other healing methods, techniques and disciplines and thus are not a substitute for consulting with a qualified doctor or other health professional that you trust. However, as we each have two eyes and two ears for increased awareness, so a second opinion is a good idea. And, as what I do is complimentary to other healing modalities; so, I do not need to diagnose, treat, prescribe or cure anybody or any thing ... as you can find plenty of other people who can, will and may be licensed to do that. Also, as I only use enough pressure to feel what is going on in your tissues, I am not engaging in massage or any other related tissue manipulation. Plus, I am only the channel for the energies that help and inspire you to heal yourself; I do not do this in and of my self only. Thus, you are the one that does most of the "work". "According to your beliefs are you healed." God is Love and Love is God and never shall this unity be broken. For, like God, Love just IS ... and it is an energy able to act far beyond our human emotions, which are also energy; as too are our thoughts. All energies originate with divine sources. Thus, energy moves and acts, causing movement, change and even inspiration! Love is the Prime Mover of the Immovable, or God, and the Universe; for Love created All-That-Is. Love created YOU! And, so, You Are Love! Until the last month of my former wife's journey through this life and into The Greater Understandings of God and All-That-Is, I did not really understand what "Love" was, though I had heard about it often in churches, songs and movies. But, one day, as I was sitting by her hospital bed, holding her hand, I told her, from my heart, "I love you, no matter what". It was then that I not only knew, but experienced pure unabashed Love, without conditions, so I finally understood what that is. I know, now, that one cannot know what Loving Unconditionally IS until one has EXPERIENCED it ... WITHOUT ANY PRE OR POST CONDITIONS OR EXPECTATIONS! You may purchase a low cost trial session with John at a Mountain High Mystics event (see Public Appearances Page) ... Get 20 minutes for $20. The path to healing is the path of life itself. Healing is a journey, whether in ones mental, physical, emotional, spiritual state or some combination of these. And as with any journey, the one going through this course will sometimes go up, down, right, left and sometimes even stop or turn around, just to reorient, retrace or correct their path. Keeping a vision of their eventual destination or outcome will guarantee success ... at some level. As John grows and understands this breakthrough mode of healing, he is puttting together books and workshops to help you understand the process of spiritual attunement (related to, but not "Reiki") to the Infinite Unified Field of Consciousness & Awareness that exists throughout all universes. With the aid of these Universal Energies (or God-Goddess) we may turn possibilities into probabilities and probabilities into reality. This is how the Cosmos and Multiverses work, and so do we at inner, forgotten, levels. This will be a 4 to 8 hour experience. More details as they develop! When John uses Love as the Healer, time and space do not matter, for Love is not only the universal creative energy of God-Goddess and the universes, but it is transcendental, thus it acts in every universe. So, we are now working in Light, Inspiration, Truth and Beauty, beyond the the limitations of the physical awareness, but still affecting the physical condition as it does. In this state We are One, Heart to Heart! Thus, Miracle and Magic are now in the room with us! I once had a girl friend, named Nancy,. She told me of a time in her life when she had a disease that is often fatal. And at the time, she was in the hospital and had just lost consciousness. The medical team came into her room and began to discuss her situation and any possible options, believing her to be "unconscious" and therefore unaware of their discussion. But, when she heard one of the doctors say that "she may not make it through the night", she woke up inside herself. And at that moment, she (with the help of the universal consciousness which is within all of us) realized what the "cure" was. She told me that, "At that moment, I began visualizing each organ of my body and I loved each one with all the strength I had. And the next morning I surprised the doctors by waking up." Though the logical mind would have disagreed, under these conditions it could not object to the fact that her soul knew that LOVE IS THE ULTIMATE HEALER! There is no greater healing power in the Universe than that of Unconditional Love! So it is that as I work with the Universal Consciousness of Love, I let the energies of Love create the conditions to restore wholeness, while I use only a gentle touch to feel what is taking place in and around your tissues ... while the Light and Love of God-Goddess does its magic. 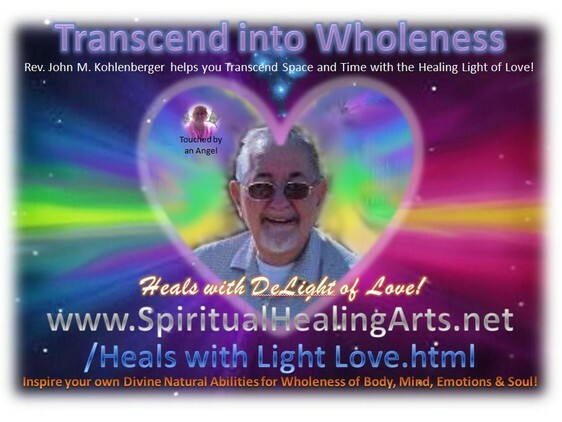 Do you want to experience the Living Spirit of Light & Love coursing through your body and being? John will be available with his healing table, channeling the Healing Light of Love, at the Hassayampa Inn, in the Arizona Room, located in Downtown Prescott, from 10 AM to 5 PM on May 21st. See the menu item "Shows & Public Appearances" for details. The healing light of love may heal all! Do not doubt, John channels the de-Light of Love to heal from the inside out. As a result, you may even feel peace and/or "Joie de Vie" after a session. For, both he and his angelic former wife, Martine, come from the Pleiades, as shown in the depiction above.. The combined multidimensional energies these two bring to earth is unique. Thus as the man Jesus said, "as you believe that you can and will be healed, you shall!" You see, all healing comes from within as self-healing. Thus, the doctor, witch doctor, therapist, shaman, reiki practitioner or spiritual healer only "inspires" your vital energies to come alive, to "sing" and to bring about a higher vibration, which creates greater wholeness, holiness and healing! And, how did I get to this place? As my abilities, beliefs and choices as a health promoter have evolved through the years, learning about "vibration and healing" with te Rosicrucians and later learning "spiritual" healing in church, then formally learning many eastern and western healing methods in a massage school, I was able to work as a licensed HHP and masseure (a male person who does massage). But, as I worked, I was still learning new things, beyond what any school or teacher can teach. At one point, I realized that I was moving energy with my fingers and instead of just manipulating tissues, which is a principle that Shiatsu is based on. (see the ReiKi Energetic Healing webpage) Then, as I felt and worked with these processes, I have refined and extended them. Thus, I have been opening to further spiritual and quantum healing concepts and methods as I grow in wisdom and stature. So, in recent years, since my healing partner (Rev. Martine) moved into the greater light of Life and Love, so now, with her support, I simply let the source energies of Life, Love and Light do their work as I step aside to just become an energy channel for Source; working more with my heart than my hands. So, as I just BE THERE, I do not restrict the cosmic healing energies of The Unified Field of Conscious Awareness, or God-Goddess. At that point, I simply allow them to do all the "work". Thus, I do this not of or for myself, but as the Creative Energies of All-That-Is work through me, to aid you. The universe only knows the word "YES"! LOVE created the Big Bang, so we as portions of that love, will get a Big Bang out of Our Experiences in Physical Reality! OUR UNIVERSE IS EXPANDING AS OUR CONSCIOUSNESS IS! ... and the Delight of Love! As I "Heal with Love & Light", I hold a space for you in my heart, where it doesn't matter what has gone on in your life or body-mind; a spot that is so large that, though I care very much about you, what you have been through is held in such total, complete, unabashed, unconditional love that whatever went on in your past becomes almost insignificant to the wholeness of what, who and where you are in this moment. Thus, when I touch it is with the gentle touch of love. In this way, love gives you room to allow you to move beyond your past experiences, opening you to possibility and Promise of a better future! This, then, helps you to shape your body-mind and emotional self so you may find more understanding of yourself in relation to love. For at your core, in your heart, Love Is Who You Are! Now, you have permission to love yourself and your place in life a little more, with reduced judgment of self and others. "Though you are surprised and sometimes doubt it, you have it within you and certain people see or sense it ... the peace, the love, the understanding. We are with you, John, and Martine is included in this 'we'." Before moving to Arizona I owned and work a family run Holistic Massage Practice in California. However, as I'm not licensed to do massage in Arizona (as I was in California), now instead of "Deep Tissue", I do a technique that I discovered during my 8 years as a Holistic Health Prattitioner (HHP) and massage therapist, which I call "Deep Tissue Stage II". NOTE: One of my helpers is an electromagnetic spirit entity that my former wife (Rev. Martine, now deceased) used to call "The Blue Guy", and may sometimes be seen as a vibrant blue light, radiating a joy for life, full of a love for everything ... no matter what! This is an energy of unconditional love! Yes, it is REAL! And, as love is a universal and transcendent energy, I give (or channel) love to you, to help you heal yourself, on all levels, even beyond this earthly experience ... through the Unified Field of Consciousness (or God). Thinking outside the box, one must realize that accidents and dis-ease, where the body is impaired seemingly through external events, and it is also important to know that everything occurs first in the non-physical (attitudes, beliefs, caring, that influence your choices and perceptions in your mental and emotional bodies). The greatest assistance that a healing support system or person can give, then, is to think of any malfunction in this holistic way, love it for what "awakening" it is bringing and then give it room to dissipate in the loving allowances of God and the Universe. So while taking physical steps to heal the problem, one also needs to look at the mental/emotional bodies and see the wholeness that lies within you, to transform what which created the dis-ease in the first place; give it light and lighten up on yourself and the world, in love. So, it's important to understand that neither the doctor, the master, the shaman nor the healer actually heal anyone. They do not heal you! As your "healing assistant", I am concurring with your desire to change your physical reality and thus assisting you to heal yourself. (Even the great healer, Jesus, said, "By your beliefs are you healed.") So, no matter what aspect we may be dealing with, when I am working with you as a "healer", I'm really there as a support system. Thus, it really doesn't really matter what's in my bag of tools, though I have many, as long as what we do together addresses your entire being and not just the physical. "Yes, Martine is among us. To you, she has been your 'Special Light' (and delight) in our group. Now, though I and we often seem to be male, because the male is an out-going (and thus communicate) energy, we also know our female or nurturing abilities. This is how healing is accomplished, as your inner and outer; the coming and the going, come together to work together, in one motion, to bring about balance. As dis-ease is a lack of comfort in one's soul created emotional-physical body, dis-ease becomes real-ized; one becomes aware that some sort of change is needed. And, as all life is living, aware-ized energy and patterns, the way to find or create ease (greater health) is to release the old limiting beliefs, ideas, concepts and energies that have been keeping you from your greater awareness of your wholeness. Thus, this one needs to relax, release and exchange the old stagnant energies for new vibrant energies. This, of course, implies an energy flow. Energy flow always promotes an exchange of life, light, love and even laughter. These are all of a higher vibration than fear, disease and demise, but even these will inspire a movement back to "balance" at a later time. 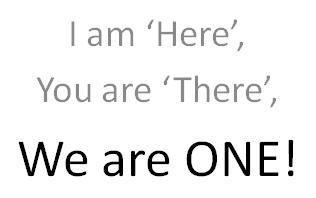 Thus, as one (you?) release the old fears, angers, judgments, prejudices and the things that hold you back from realizing your greater wholeness, you promote movement, life, light, inspiration, joy, creativity, creating a magnetism that draws new possibilities, people and experiences to you and into your life-light, that are less restricting and less painful. As was said earlier, the flow brings more balance and wholeness. Some even call this wholeness, "holiness". REMEMBER: "With God, All things are possible!" In my dream, I was feeling something about the merging of my male and female energies and then I saw two candles; a red one and a silver one,both were lit and burning. Is this the burning flames (twin flames) of love between my former wife Martine (silver), now out of her body, and myself (red) in physical reality? Dr. Peebles Comment (20 Dec. 2014): You’re a mysterious one these days, we hardly hear from you. You’ve really gotten down to earth here, helping people and talking to people. This is great. You’re not having to send your prayers to heaven so often because you’re sending them out to the world. It’s beautiful, it really is. We’re very proud of you. So what would you like to ask, my friend? John: I had a dream, last night and it seemed like there was something about putting the male and female together and at the end of the dream was (I was shown) a silver candle and a red candle. Do you have any enlightenment about what was going on there? Dr. Peebles: Yeah, that’s you my friend and your dear wife and you are two candles in the night and for the whole wide world. And that was, really what it was, her Christmas Present for you. The red is the love she offers to you and the silver is the angel that she is. You see, you light each other. When one went dim, the other lit them up. That’s the way the relationship went, yeah? Dr. Peebles: You’re very welcome. ... for this is the whole of the law. All else is logic to trip over and not of the simplicity of your Heart!. Do You want to Use a Pendulum for Dowsing your Physical Well Being? This is simply using a device to affirm what your beingness already knows ... because of your connection with, and living within, the Soup of Universal Consciousness of All Things ... which may become anything, with no limits ... in time or space, as it is BEYOND what is or was, or will be within in all possibilities and probabilities ... for this is given to us by Unconditional Love. so you can schedule your sessions as you like or as you feel the need. I offer a service for you to use at YOUR FREE WILL. I slept peacefully and without pain ,all night last night, after having my session with you. Thank you again for the wonderful session. I should sleep well tonight. What is the essence of healing? What happens when someone "gets well," whether it is on the psychological, emotional or physical level? What happens is that this person is able to connect again to his or her own inner light, to his or her own greater Self. This connection has a healing effect upon all layers of the self- the emotional, physical and mental levels. What every person is looking for in a healer or teacher is an energy space which enables them to reconnect to their inner light, the part of them that knows and understands. The teacher or healer is able to offer this space because they have already made this connection within. The healer has a frequency at their disposal, an energetic vibration which holds the solution to their client's problem. To be a healer or teacher means to carry the energetic frequency of the solution in your energy field and to offer it to someone else. That's what it is, nothing else. Basically it is a process that can take place without words or actions. It is the energy itself that you have as a teacher or healer which has the healing effect. It is your enlightened energy that opens up the possibility for someone else to "remember" what they already know, to connect to his inner light, to his or her intuition. It is this remembrance, this connection that makes the healing happen. All healing is really self-healing. All things are vibrating energy, thus matter has wave properties usable in a particle-wave duality in the Multiverses. Light is a vibration that has both wave properties and discrete particle properties (photons). Light also has a particle-wave duality and is part of the EM (ElectroMagnetic) spectrum of known energies that pervade our known universe. Instead of "reality" being composed of continuous deterministic fields (as science has assumed up to now), the more modern view now is that Creation is composed of one great unity (space? light?) that may be described as existing in mathematically discrete statistical fields e.g. one may use probability waves to predict the location of a particle, but not always know "exactly" where it is in this Field of Unified Consciousness. Thus many things exist in more than one place and/or time, at once, in which case these may become artificial limitations to any possibility. Energy can neither be created nor destroyed, thus the energy of Creation is still here and still active - forever, throughout the many dimensions of all time and all space! Thus, any healthy part your body may regenerate or transform ... and does in "time". All Matter is formed by various frequencies of vibration, (with no strings attached) forming information nodes (in formations that we recognize). The resulting vibration may be called "space","magnetism & gravity", "light", "love" or what some call "God". But, like a rose, it is the same, no matter what the name, "What is, simply IS!" The love and light (vibrations) of Creation formed all that is and thus may (and will) change anything in the great forever-now that we call "time", at any time. Thus "what is" is unlimited by "what is" and all tings are possible, though your love makes certain things more probable. Change is constant so our desired changes (as in healing) are shaped and directed by our co-created attitudes, beliefs and constant thoughts, acting (physically) through the EM (ElectroMagnetic & Light) fields, all of which are Awarized Divine Energy. This may bring "instant" change, though all change happens in its own (quantum) time - and in its own (quantum) way. Many, in the past, have described this as, "God acts in strange ways." The Result: Drugless Pain Relief and Rejuvenation through time. OUR FUTURE includes expanding commercial space, for artistic sales and a healing office.